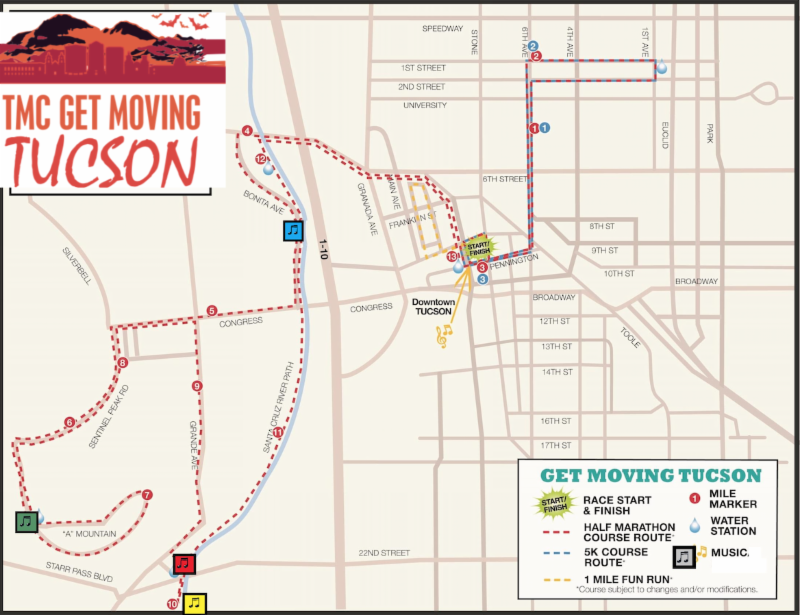 Free entry to Presidio San Agustin for all TMC Get Moving Tucson entrants! YES: it will be crowded, so please be nice and please be patient as the volunteers and the staff at The Running Shop help. YES: we have unisex and women's sizing. YES: The Running Shop will have sale items, so shop away! NO: you cannot pick up your finisher's medal before finishing the race. 5:20 am Final in-person registration and packet pick-up begins -- same yes and no applies! 2) Race beneficiary Presidio San Agustin del Tucson is offering free museum entrance to all race participants and guests from 9:00 am - noon on race day . Visit the historic Tucson Presidio, which is (literally) just steps from the finish line (go north on Church, turn left on Washington and you're there). 3) Thanks to your entry fees plus help from TMC, Cox Communications, and Rio Nuevo, the TMC Get Moving Tucson events raise funds for local organizations, including Watershed Management who will be managing a water and Gatorade aid station on the course), and Team Hoyt Arizona (who will hand out free coffee from their Team Hoyt trailer! ), and the Southern Arizona Roadrunners , who are helping with all sorts of race details. And of course, the BEYOND-Tucson Foundation will receive almost $10,000 as part of the Gabe Zimmerman Triple Crown! 4) Volunteers: We can manage with the friends we have, but if you know anyone who wants to help out before or after the race, we're happy to take a helping hand. If you know anyone else who wants to hand out water or gatorade or help hand out medals at the finish line (or even be our lead bike rider for men and women) we'd love to hear from them. They can write Tia at tia@runtucson.net. 5) Unless you are one of the 32 people have signed up for the Virtual Triple Crown, you must finish the race on race day to get your finisher's medallion. 6) We'll send out additional updates, but remember that you can always go to the SAR website at www.azroadrunners.org for updates. You can check to see if your registration is accurate in two places: at the SAR site or on our race registration page . If you want to change your race distance, please send me an email by Wednesday October 24th at midnight and we'll get you squared away ( randy@runtucson.net ). OK -- one way or the other, thanks for being part of the local fitness scene! YES: it will be crowded, so please be nice and be patient. YES: please be patient with your fellow runners and please be nice to the volunteers and the Running Shop staff. Check out parking at the Downtown Tucson Partnership website here . * If you think it will take you more than 3 hours to do the half-marathon, we ask that you do the early start. Sunday is due to be especially hot and we want you to be safe. The early start will help ensure your personal safety as the day heats up, as well as help the ambulance units, police, and volunteers who are tasked with making sure you stay safe. 2-EE The Clown will be foolin' around with balloons and face-painting, while Cox Charities will host a jumping castle for the kiddos. Race beneficiary Team Hoyt will provide free coffee each morning. Some of the race director's University of Arizona students at the McGuire Center for Entrepreneurship will be on hand to talk about their new business ventures. A few of the student teams are seeking feedback from runners and walkers on their venture ideas, so please stop by and talk with them! 9:00 am 10 mile mark at Santa Cruz River Path near Starr Pass - please start early if you are worried about this! You must finish the 5k or the half-marathon to receive the special TMC Get Moving commemorative medallion, crafted by industry-leader Ashworth Awards. Prize money awards are based on "gun" starting time for overall and masters, and chip time for age group. We're back to the original course, through Downtown and West University, over to the Sentinel Peak, along Grande and the Riverpath, then back along St. Mary's to Jacome Plaza. The turn-around on the riverpath will have a big ol' Roadrunners Timing inflatable arch, so you will have to cross the mat heading south, then turn and cross it again heading north. Easy-peasy -- but if you do not have a time marker at that mat, you will be disqualified. All Half-Marathoners are asked to stay to the right on the path at all times. Thus, when you head south we ask that you stay on the west side of the riverpath, then when you head north you will also stay on the right, on the east against the riverbed. The Riverpath is open to pedestrians. We will have signage explaining that a special event is occurring, but please note that others will be on the path so please do not wear headphones for personal safety. Water Stations: at approximately 3.1, 4.5, 6.5 & 7.5, 9.5 & 10.5, and 12. We will have Gatorade on the Riverpath. PortOJohns : There will be bathrooms at the 3.1 mile mark and at the water stop near the 9.5 mile mark on Grande. Certified : The TMC Half-Marathon is a USATF certified course measured by Dave Hill. This course stays the same as always, with one lap of the staging area, then the loop around West University. It is measured, but not certified. The 5k will have a water stop staffed by the Sam Hughes Huskies grade school cross country team. This short-mile course stays the same as recent years, with the loop of Court and Meyer Street, starting and finishing where the Half-Marathon finishes. Special thanks to the SAR team led by Diane Manzini for coordinating all the SAR FitKidz goodies. Special thanks to Cox Charities for help with the children's activities, including the jumping castle and face painting! 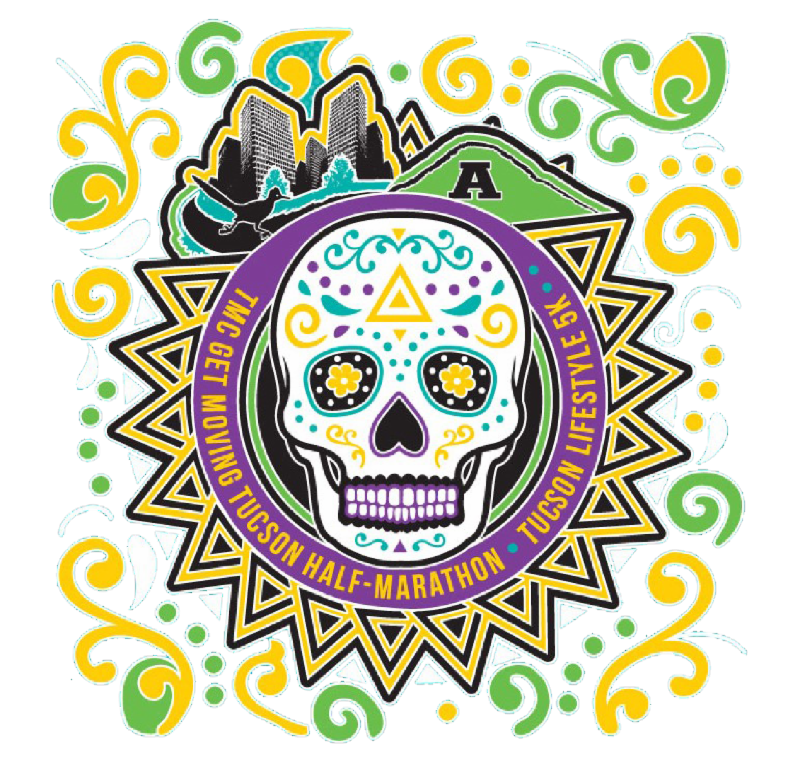 All adults are free, but they must register and they will not receive a shirt or finisher medal. Don't forget -- wear a costume! 1) Your registration has raised $9,500 for the BEYOND-Tucson Foundation, dedicated to improving the health and well-being of our community -- click here to know more about this wonderful local charity. 2) All runners will receive the same finisher's coaster medallion -- you as GZTC registrants are the only ones to have received the first medallion, though, so you will have the completed series. 3) For those GZTC registrants who cannot be in town, you can simply run 3.1 or 13.1 miles at anytime this weekend then post your run photos to the SAR instagram or facebook pages and the Run Tucson instagram page and facebook page. Spectators : The course is open to all spectators. We ask that spectators follow traffic laws and be careful if on bicycles (for instance, no cars on the closed roads or the Loop), but we'd love to see all your friends and families out on the course cheering for you! Headphones : Please do not wear headphones. It is a safety hazard and a potential disruption to those near you. We have live music at multiple locations on the course, so there is plenty of opportunity to get jazzed up! Plus, you can always chat with your running neighbor. Weather : Race morning is supposed to be clear with start-time temperature of 61 and close to 80 by 10:00 am. It looks to be a hot day, so please wear a hat and sunscreen and if you will be out for more than two hours, please bring water! If you will be more than three hours, please do the early start! Timing : Please put your bib number on the front of your shirt using the pins provided at registration. Greg Wenneborg is our official timer, and he will time the race with the IPICO system. NOTE: Following USATF standards, official results, all cash prize money, and all age-group awards will be by "gun time." You cannot wear headphones and be eligible for the prize money or RRCA Championship status. NOTE: All late starters will receive the gun time as their official starting time. ParkingParkingParking: There is plenty of free street parking in Downtown Tucson on race morning. 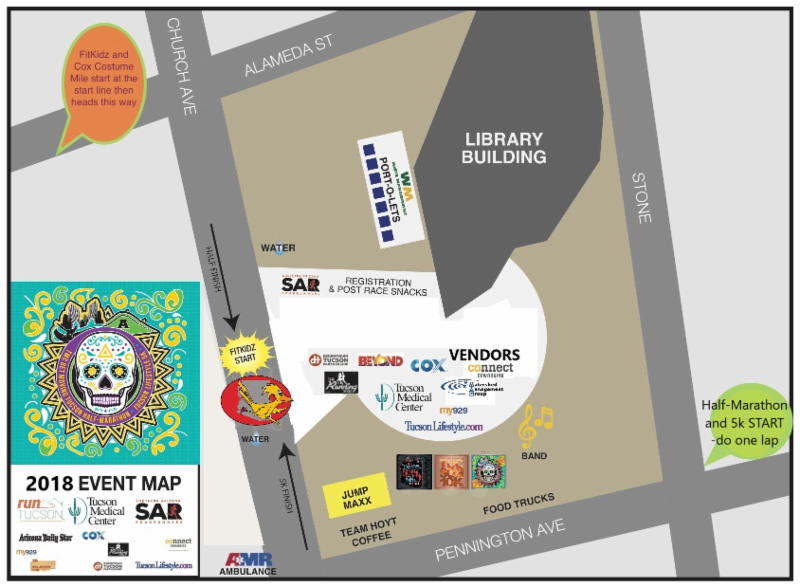 See maps put out by our friends at the Downtown Tucson Partnership . Please note that the Joel D. Valdez Library parking lot will most likely be off-limits because Alameda will be closed to traffic on race morning. No Pets: Please do not bring pets to the event - and do not leave them in your car!! Please share your story -- we use instagram and twitter and facebook primarily, but we're trying to do more on youtube, too. Tag @RunSAR and @RunTucson, use hashtags #getmovingtucson, #gabezimmermantriplecrown, #runtucson and whatever else you think is creative: #costumerun or #mylegshurtfromrunningtoofast or #runningforbeer or whatever you want! Photos: Our friend Kerry Whelan, aka, Goatographer, will be running about snapping race photos. Check out his facebook page: facebook.com/goatographer . As Kerry says, "They'll be a lot of you out there, so best not be shy if you want your happy face and winning style recorded for posterity." Our other friend, Damion Alexander, may be out on a bike, snapping pictures from that vantage point. Check him out here . Please share your photos with us @RunSAR and @RunTucson! We're glad you're part of our awesome Halloween running weekend! NEXT UP: Free social runs, coached groups, & awesome races! 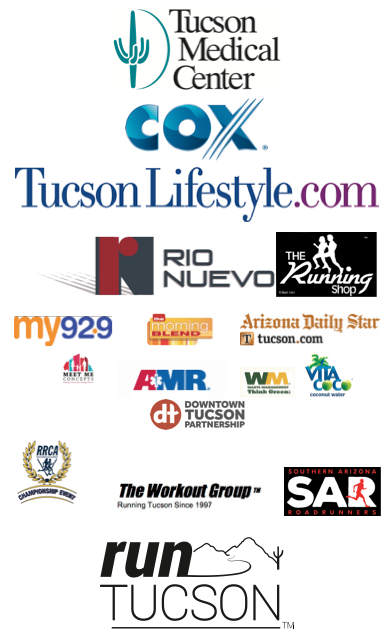 Monday: join us at the free Meet Me at Maynard's Walk/Run in Downtown Tucson. Show up anytime from 5-6:30. Tuesday and Thursday: join our Workout Group for track repeats, fartlek workouts, or easy running. Reid Park, 6:00 pm. Wednesday: join us at the free Meet Me Wednesday's at S. Phillips Plaza, along the Rillito Riverpath. Show up anytime 5-6:30. We've put together a super-cool and speedy course that starts in front of the Kino Veteran's Memorial Stadium and ends on the centerfield of the stadium. Beautiful views, unique and fast course --great for personal bests and awesome for havin' fun! 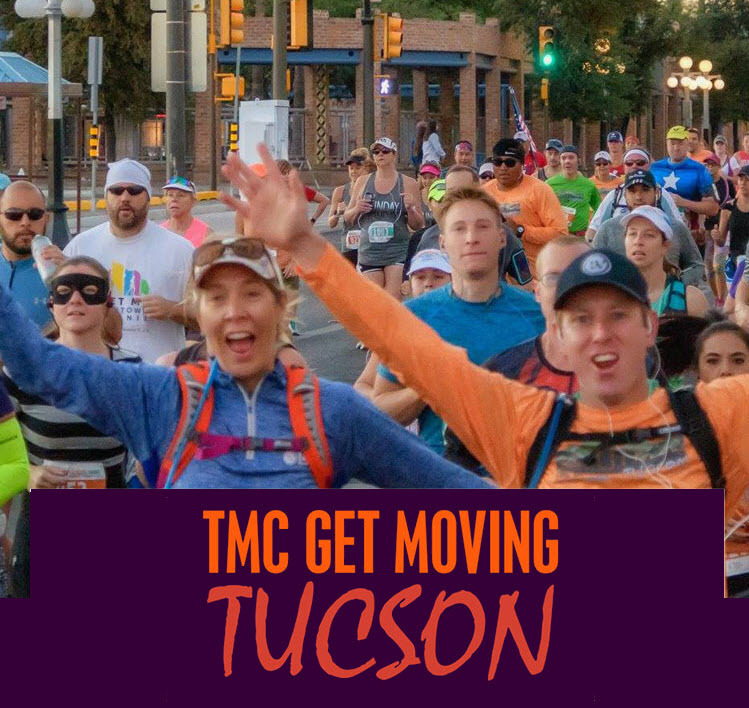 The first 300 male and female registrants receive the free wine glass, while all registrants receive soft & comfortable TMC BE Tucson shirt. Register Here. Welcome to the New Year’s Day HAIR OF THE DOG Run/Walk, benefiting the Humane Society of Southern Arizona. All registrants receive an Event Finisher’s Glass, and a Collectible Poster Art + a free beer at the Dragoon Brewing Co. Beer Garden (or non-alcoholic beverage). Post-race treats, sweet or savory, compliments of Le Buzz Caffe, the famed east-side European style patisserie. Info and Registration Here.